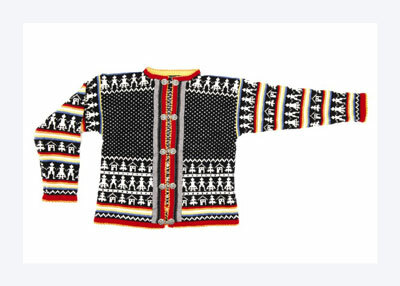 Fair Isle: Made famous by knitwear from Fair Isle, one of the islands of Scotland, the Fair Isle technique is one form of stranded colorwork. 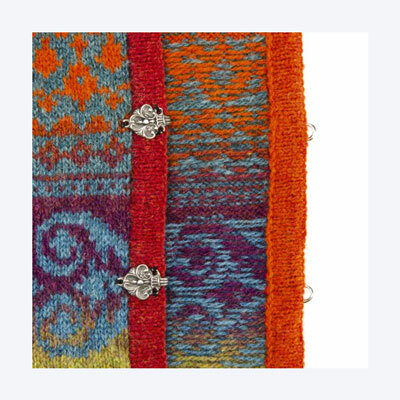 Fair Isle is typified by its use of symmetrical geometric motifs, two-ply Shetland yarn, and muted, sophisticated colors. Scandinavian: Stranded colorwork originating in Scandinavia (Norway, Sweden, Denmark, and Finland) is very different from Fair Isle, though the knitting techniques are similar. Scandinavian colorwork is distinctive in its large, often asymmetrical motifs, three-ply yarn construction, and bright, clear colors. “A” is the background, or receding, color, and that strand should always cross below the other. “B” is the foreground, or outstanding, color, and that strand should always cross above the other. 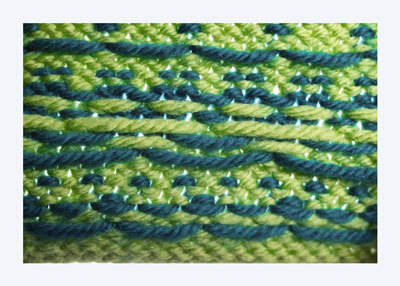 Float tension: The second key to stranded colorwork is making the strands of the unused color loose enough to keep the work from puckering. When changing colors, stretch apart the last stitches made in the prior color, and then loosely lay the new color across them on the wrong side. This strand on the back of the work is called a float. Knit with the new color, releasing the tension on the previous stitches. A properly tensioned float will relax into a “swag” or “smile” on the wrong side. Working in the round: Stranded garments are more easily worked in the round than as flat pieces. 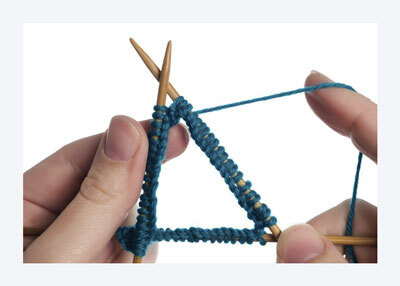 Once you cast the required number of stitches onto a circular needle, you join the round to form a tube. 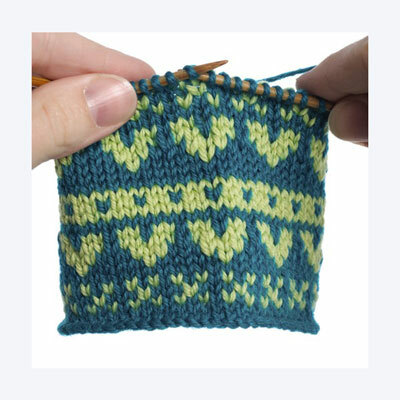 From that point on, you knit all the stitches of every round, creating the motifs in stockinette stitch without ever purling from the wrong side. 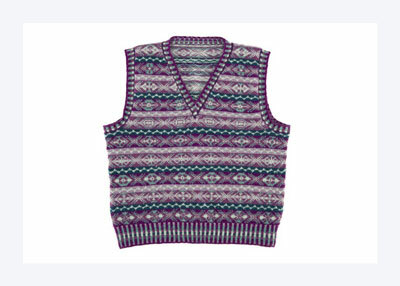 Steeks: Once the body and sleeve tubes are complete, openings are cut into the body tube for armholes, necklines, and, in cardigans, front openings. 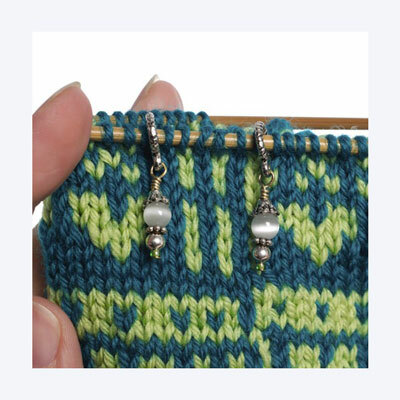 Steeks are placed in the areas where openings are planned, such as the area between the beaded stitch markers above. Bindings and facings: The cut edges of steeks are covered by knitted bindings and facings, and sometimes by sewn-in fabric or ribbon strips. 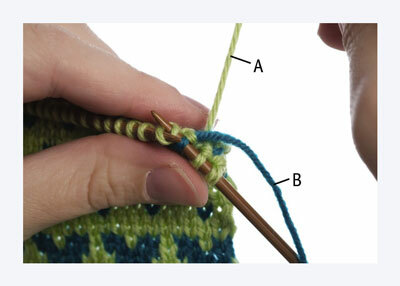 Begin by casting the required number of stitches (in one color only) onto the suggested circular needle or DPNs. 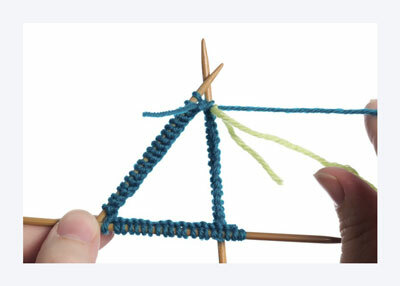 Join the round for circular knitting. Add the second strand by tying it onto the existing strand. You can pick out the knots later, but doing so is usually unnecessary. Reading the chart from right to left, and working from the bottom row to the top, work each stitch in the color indicated by the chart. Each time you change strands, check that you are bringing the background color (“strand A”) up from underneath the motif (“strand B”) color. The motif color (“strand B”) should always be carried above the background color (“strand A”). To switch from one ball of yarn to another (for instance, to change the colors), break the working strand, leaving a 6-inch tail. Join the new strand to it by tying a knot up close to the work. Create long, relaxed floats as you strand the unused color along the back of the work. 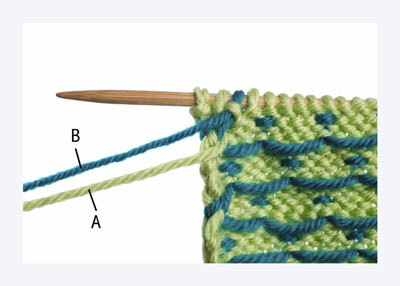 Stretching the stitches apart on the right needle will help you create loose floats. It’s almost impossible to make the floats too loose, so when in doubt, make them even looser than you think they need to be. Properly tensioned floats, when seen from the wrong side, should look like little swags or “smiles.” The extra slack you build into the floats usually disappears during blocking, when your knitted fabric evens itself out.